The YouTube video below shows the pouring of moulten Brass into the plaster moulds to create a “tree” of Investment Castings. In the previous stage of manufacture, the wax masters have been melted out of the plaster, creating the moulds (lost wax Investment Castings). The molten Brass is pulled through the moulds with vacuum assist (at over 900 Degrees Celsius). Sylatech Limited are currently involved in many exciting projects, manufacturing Investment Castings for customers from a variety of industries (including Aerospace, Military, Defense, Medical and more). For more information on Sylatech Limited, visit their official website by clicking here. 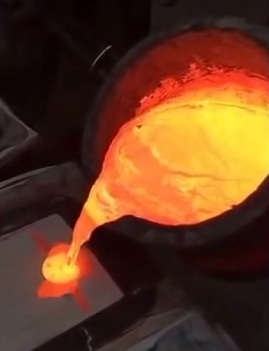 Watch the video of Pouring Molten Brass below.